Surprising connections between seemingly unrelated tissues. The existence of this gene was hinted by large-scale genomic studies, but its exact muscle-related function remained largely unknown until a couple of years ago. A breakthrough paper in Nature early 20122 showed that PPARGC1A expression in mouse muscle stimulates an increase in expression of FNDC5. More important, it was found that proteolytic cleavage of the FNDC5 extracellular domain releases irisin, a newly identified 130 kDa hormone peptide (Figure). Irisin was shown to elicit a differentiation adipose tissue program of white adipocytes into brown adipocytes, causing an increase in energy expenditure with no changes in food intake. Irisin thus raised immediate interest as a potential therapeutic lead related to obesity, with nearly 40 relevant papers in 2013 alone (see3 for summary). Irisin, the FNDC5 product, is secreted by muscle cells and affects adipose tissue, thus may be naturally defined as a novel myokine. That is why it is named after Iris, the messenger of the Olympian gods. How does irisin exert its paracrine effect? The receptor on white adipose cells has not yet been identified, but it is suspected that the peptide’s action is mediated by UCP1 (Uncoupling Protein 1, mitochondrial, proton Carrier). UCP1, a mitochondrial protein that plays a key role in heat production by uncoupling the activity of the respiratory chain from ATP synthesis, is a differentiation marker of the transition from white to darker adipose tissue4, a color change associated with increasing mitochondrial counts. Over the last year a few papers question some of the main results presented by Spiegelman1, e.g., the validity of irisin cell surface cleavage and shedding, the irisin detection method, and the rigor of the effect of irisin on adipocytes in cell culture.5 However, the same group has recapitulated their findings, using improved methodologies.1 Shedding of a peptide related to FNDC5 is further supported by plasma proteomics results. Further, an intriguing relationship between muscle and adipose tissue is revealed during embryonic development, whereby recent lineage tracing data indicated that brown fat cells and skeletal muscle share a common embryonic anatomical progenitor, the somite. 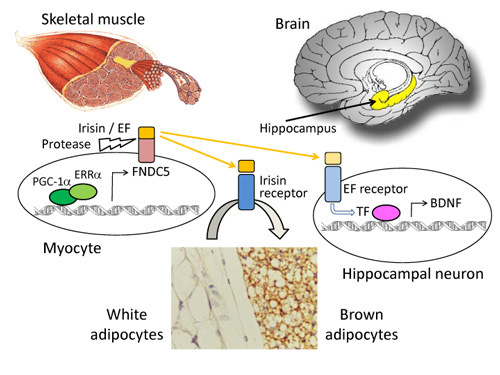 But the really exciting recent results on FNDC5/irisin have to do with the brain connection1, as reviewed8. It has been known for nearly a decade that exercise, in particular endurance exercise (employing many muscles with ample oxygen supply) has beneficial effects on brain health and cognitive function6, particularly in the aging population. Exercise has also been reported to improve neurological disease states like depression, epilepsy, stroke, and Alzheimer’s disease. The effects on brain are most obvious in regions related to learning and memory, such as the hippocampus, where de novo neurogenesis has been seen in response to exercise7. An important mediator of such effects is BDNF (brain-derived neurotrophic factor), which promotes neuronal cell survival, differentiation, migration and plasticity. However, the mechanism by which BDNF is induced by exercise remained elusive. In their paper1 Wrann et al., show that FNDC5 is also elevated by exercise in the hippocampus of mice, that overexpression FNDC5 in primary cortical neurons increases BDNF expression, and that knockdown of FNDC5 reduces BDNF. Further, elevated blood irisin elevates BDNF in hippocampus. In contradiction, direct application of irisin to cultured hippocampal neurons does not raise BDNF levels, suggesting that perhaps a different FNDC5 cleavage product, termed exercise factor (EF), may be at work8 (Figure). The mechanistic complexity, missing cues, and measure of controversy of this intriguing tripartite molecular crosstalk promise that exciting developments are still ahead. 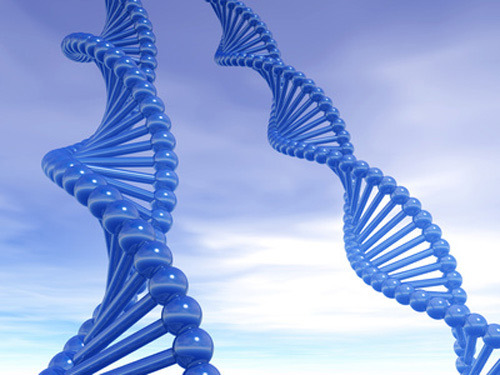 Doron Lancet and Gil Stelzer work in the Department of Molecular Genetics at the Weizmann Institute of Science. Yaron Golan and Ariel Rinon work for LifeMap Sciences. 1 Wrann, C. D., et al., Exercise Induces Hippocampal BDNF through a PGC-1α/FNDC5 Pathway. Cell Metabolism, 2013. 18(5): p. 649–659. 2 Bostrom, P., et al., A PGC1-alpha-dependent myokine that drives brown-fat-like development of white fat and thermogenesis. Nature, 2012. 481(7382): p. 463–8. 3 Novelle, M.G., et al., Irisin, Two Years Later. Int J Endocrinol, 2013. 2013: p. 746281. 4 Beranger, G.E., et al., In vitro brown and “brite”/”beige” adipogenesis: human cellular models and molecular aspects. Biochim Biophys Acta, 2013. 1831(5): p. 905–14. 5 Erickson, H.P., Irisin and FNDC5 in retrospect: An exercise hormone or a transmembrane receptor? Adipocyte, 2013. 2(4): p. 289–93. 6 Mattson, M.P., Energy intake and exercise as determinants of brain health and vulnerability to injury and disease. Cell Metab, 2012. 16(6): p. 706–22. 7 Kobilo, T., et al., Running is the neurogenic and neurotrophic stimulus in environmental enrichment. Learn Mem, 2011. 18(9): p. 605–9. 8 Xu, B., BDNF (I)rising from Exercise. Cell Metab. 2013. 18(5):612–4.